Yeast VMA1-derived homing endonuclease. The intein is shown and green, and the exteins are shown in red and blue. Only short portions of the exteins are included in the structure. In most cases, each gene encodes a single protein, but cells have found ways around this limitation. Viruses, with their tiny genomes, often contain genes that encode long polyproteins, which are then chopped into a bunch of functional pieces by enzymes. Inteins are another way that cells make several proteins from one gene. The first example of an intein was discovered in the yeast vacuolar ATPase (shown here from PDB entry 1jva ). The gene encodes the ATPase protein along with additional protein embedded in the middle. 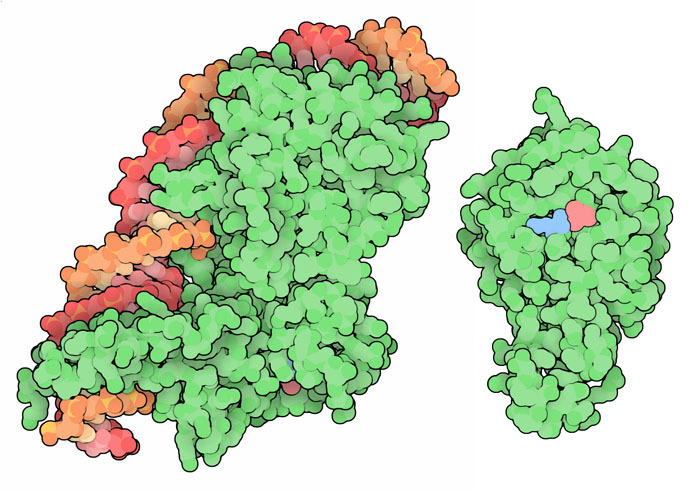 This embedded protein is termed an intein (shown here in green), and the two halves of the ATPase are termed exteins (shown here in red and blue--note that this structure only includes a small portion of the exteins). When the protein is made, the intein splices itself out of the chain and connects together the two exteins, creating the functional ATPase. Many inteins include two parts: a portion that splices the intein out of the overall protein chain, and a portion that acts as a DNA-cutting enzyme. This enzyme is often termed a homing endonuclease because it homes in on DNA that doesn't encode an intein. Homing endonucleases act as selfish genetic elements, with an insidious method for propagating themselves between different copies of genes. They don't attack genes that already encode inteins, but they cleave genes without them. Then, the cell's normal repair mechanism will fix the break, but using the intein-including gene as the template. So, when the damage is corrected, the gene is left with an intein. This isn't a problem, though, since the intein will splice itself out of the protein when it's made. Inteins are modular protein splicing machines, and thus have been useful for biotechnology. Working inteins have been isolated from cells, and then engineered into new proteins to create self-splicing proteins for specific functions. For instance, engineered inteins have been used to connect together peptides with different types of labels to assist with NMR experiments, or to add non-natural amino acids to a protein, or even to connect proteins to quantum dots. Inteins have also been used to connect the two ends of a chain, creating a cyclic protein. A typical homing endonuclease intein bound to DNA (left) and a mini-intein (right). Not all inteins include a homing nuclease. Some forms, termed mini-inteins, include only the splicing portion. Examples of each are shown here. On the left is a typical large intein that includes a homing endonuclease, shown here spliced out of its protein and bound to DNA (PDB entry 1lws ). 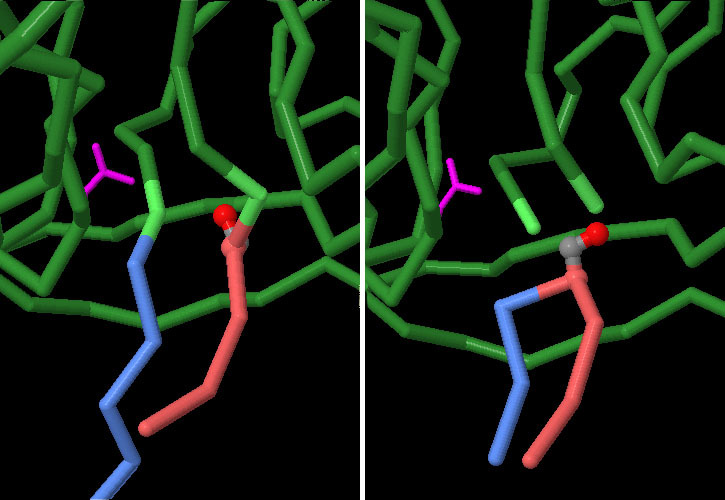 On the right is a mini-intein that is found in the gene for a mycobacterial gyrase (PDB entry 1am2 ). It includes just enough protein to perform the splicing reaction. Two structures of the vacuolar ATPase intein show the protein before and after its splicing reaction. In both cases, a few of the catalytic amino acids were mutated to slow the reaction, so that the structure could solved. 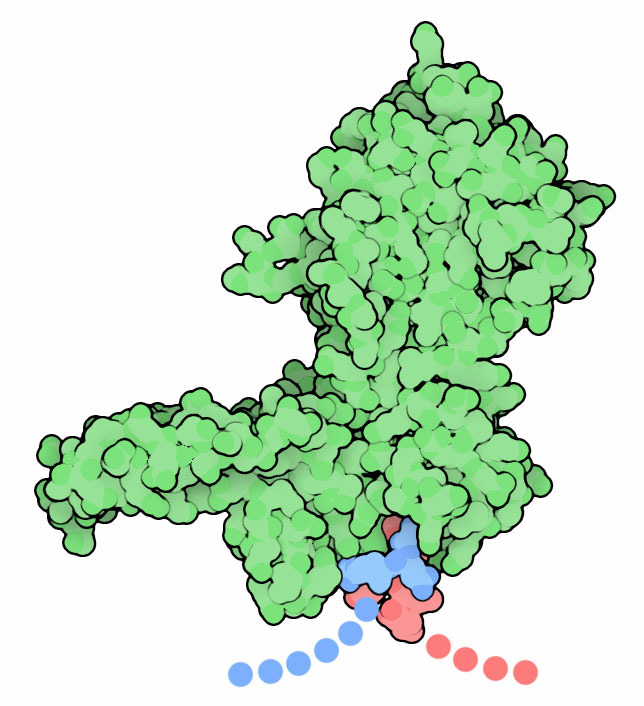 PDB entry 1jva (left) shows the intein (green) before the reaction, with small segments of the exteins (red and blue) attached. PDB entry 1um2 (right) is after the reaction, and the two exteins have been connected together. In the actual protein, the exteins are much larger, and when joined they form part of a large proton pump. To compare these two structures in more detail, click on the image for an interactive Jmol. Structures are available for many different inteins. Can you find them in the PDB? Do the structures include the homing endonuclease, or are they mini-inteins? Do the structures include portions of the exteins? Why is it difficult to determine structures that include exteins? S. Elleuche and S. Poggeler (2010) Inteins, valuable genetic elements in molecular biology and biotechnology. Applied Microbiology and Biotechnology 87, 479-489. Y. Anraku and Y. Satow (2009) Reflections on protein splicing: structures, functions and mechanisms. Proceedings of the Japan Academy, Series B, 85, 409-421. Y. Anraku, R. Mizutani and Y. Satow (2005) Protein splicing: its discovery and structural insight into novel chemical mechanisms. IUBMB Life 57, 563-574.